Jensen Farms of Colorado has announced a voluntary recall for specific shipments of their whole cantaloupes. The cantaloupes are being recalled because of the possibility of bacterial contamination. The whole cantaloupes are suspected to have been contaminated with the bacteria Listeria monocytogenes. The company is already in the process of recalling the fruit produce, and is working with local government and the Food and Drugs Administration in implementing the recall. The affected cantaloupes have been distributed in the states of Illinois, Tennessee, Texas, Minnesota, New Mexico, Missouri, Oklahoma, New Jersey,Pennsylvania,Wyoming, Utah, Colorado, Kansas, North Carolina, Nebraska, Arizona and New York. The affected cantaloupes were shipped from July 29 to September 10, 2011. 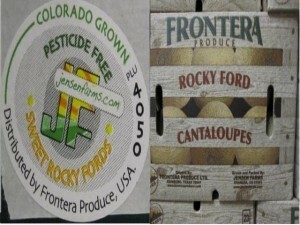 The cantaloupes can be identified by a white and green sticker that is printed with “Product of USA – Fontera Produce – Colorado Fresh – Rocky Ford – Cantaloupe.” The sticker could also be gray-green-yellow printed with “Jensen Farms – Sweet Rocky Fords.” If the cantaloupe has no sticker or label, it is best to contact the store about where the cantaloupe came from. Listeria monocytogenes is one of the most common bacteria that infects food. This type of bacteria causes a type of food poisoning called Listeriosis. In pregnant women, Listeriosis can cause miscarriages or still births. Jensen Farms emphasizes that the recall only involves whole cantaloupes and not all of the farm’s produce. This recall is done by the company as a safety precaution for all consumers. Consumers who may have bought one or more of the affected cantaloupes are advised to dispose of the product. For any question that they may have, they can call Jensen Farms at 1-800-267-4561 from 9:00 AM until 4:00 PM, Mountain Standard Time.